A charity is appealing for a celebrity TV chef to do the same for elderly care homes as Jamie Oliver did for school children's meals. Enquiries by the Liberal Democrats have shown that more than 2,000 homes in England failed to meet government minimum standards for meals last year. The Lib Dems and charity Counsel and Care called the figures "shocking". Social Care inspectors failed one in five elderly homes in England on the standard of their food last year. Parliamentary questions put down by Lib Dem MP Paul Burstow revealed that 250 homes missed the standards by a wide margin, and about 1,800 more narrowly. 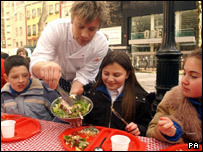 Mr Burstow and the charity are calling on a celebrity chef to step forward and campaign for better food for the elderly in the same way Jamie Oliver did in his campaign for improved school meals. A spokesman for the Department of Health said care home residents should always have nutritious, attractively presented, meals and that social care inspectors were rigorous in ensuring standards were met. This summer celebrity chef Paul Rankin said he would push for improvements in the quality of food served to the elderly in the UK's residential care homes. He called for money spent on food in homes to be increased from an average of £18 to £28 a week and for more healthy menus to be introduced. He became involved after a friend who owns a nursing home in Belfast asked him to help out with the catering.